As a kid, my favorite part of Easter were the days leading up to the holiday, when my family would dye eggs. This became an enormous event in my household, as dozens and dozens of perfectly white eggs would become little oval canvases for arts and crafts. 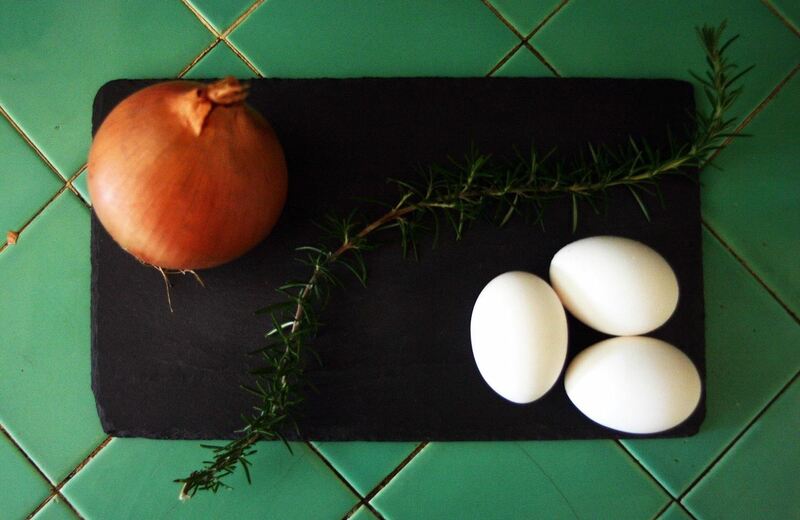 We generally eschewed traditional dyes — which often have less-than-ideal toxins in them — and instead, we'd make all-natural Easter eggs, colored with onions and cabbage, and designed with herbs. These are easy, beautiful, and above all, fun. If for no reason other than sentiment, my go-to dyes are yellow onions and purple cabbage, but there are so many more things you could use. Turmeric, tea, coffee, beets, rose petals ... the list goes on. Making the dye is simple. Take LOTS of your dye material, like onion skins (I recommend the skins from 10 onions for a full pot of water) or shredded cabbage and put them in a pot filled with water. Add a tablespoon of distilled white vinegar, and boil for 20–30 minutes. Now for the fun part: while the dye boils, design your eggs. First, rub a small amount of vinegar on the eggs, which will help your stencils stick. Then take some herbs (my favorites are rosemary and cilantro), or even some small leaves or flower petals, and place them artistically on your eggs. Next, take a segment of pantyhose (you can use old ones, presuming they're clean, or buy new ones for a very cheap price), tie them off as tight as possible, and you're ready for Step 3. There are two schools of thought here. I prefer to start with raw eggs and hard boil them in the dye. To do so, lower the heat on the dye water until it's simmering. Next, add your pantyhose-wrapped room-temperature eggs to the water and cook for 10 or 12 minutes, then turn off the heat and let it sit in the dye until you have the color you'd like. The other option is to boil your eggs ahead of time, then place them into the cooled dye, and leave them there for a few hours, until the right color is reached. The former method is a lot faster — you kill two birds with one stone, and the color is absorbed more quickly when the eggs and dye are hot. But the latter method gives you greater control of colors and is the ideal choice if you're looking to truly make a piece of art. 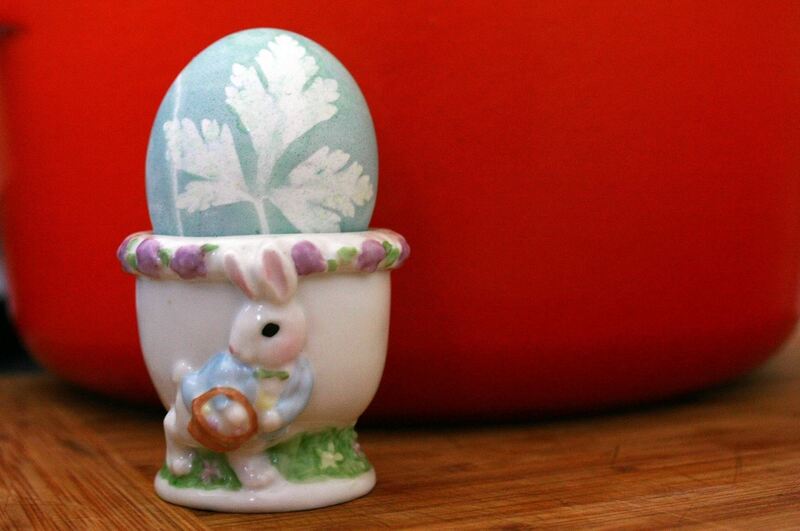 I always keep the dye around to color plain eggs with, as the outcome is gorgeous even without the stenciling. 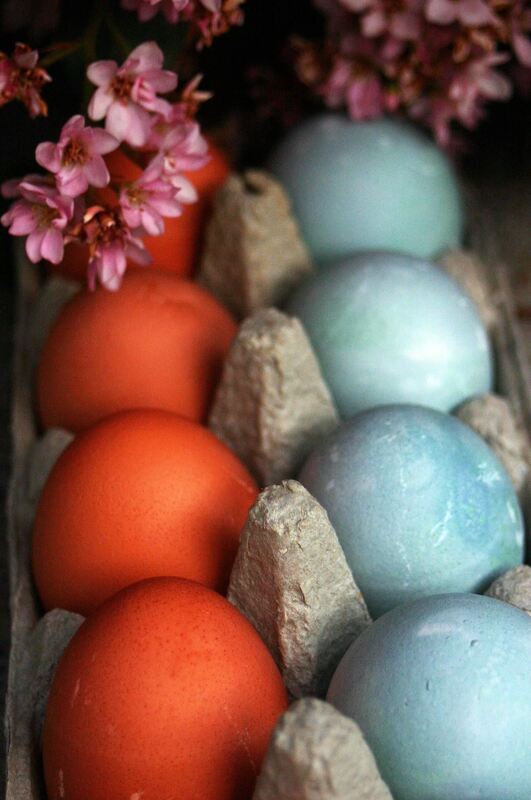 When your eggs have reached the right color, remove them from the dye, and let them air dry (or dab them with a paper towel). After they've dried, cut off the pantyhose and remove the herb stenciling. What awaits you should be a stunning egg. After you've had a chance to marvel at your gorgeous eggs through Easter, then you get to do the best part: eat them. Just don't forget our amazing trick for peeling! One of the best parts of making eggs this way is that you can experiment with different ingredients and methods, including wrapping your eggs individually in onion skins. If you want extra special eggs, you could even scramble them before you boil them. Want more dye ideas? Try out these gorgeous spider bunny eggs. Give someone a great Easter surprise and bake cakes inside real eggshells. Or why not serve up a breakfast of perfectly poached eggs?